"Talika" redirects here. For the village in Iran, see Talika, Iran. Tilopa (Prakrit; Sanskrit: Talika or Tilopada) (988–1069) was born in either Chativavo (Chittagong), Bengal or Jagora, Bengal in India. He was a tantric practitioner and mahasiddha. He practiced Anuttarayoga Tantra, a set of spiritual practices intended to accelerate the process of attaining Buddhahood. Naropa is considered his main student. At Pashupatinath temple premise, greatest Hindu shrine of Nepal, there are two caves where Tilopa attained Siddhi and initiated his disciple Naropa. Tilopa was born into the priestly caste – according to some sources, a royal family – but he adopted the monastic life upon receiving orders from a dakini (female buddha whose activity is to inspire practitioners) who told him to adopt a mendicant and itinerant existence. From the beginning, she made it clear to Tilopa that his real parents were not the persons who had raised him, but instead were primordial wisdom and universal voidness. Advised by the dakini, Tilopa gradually took up a monk's life, taking the monastic vows and becoming an erudite scholar. The frequent visits of his dakini teacher continued to guide his spiritual path and close the gap to enlightenment. and from Matangi, the resurrection of the dead body. As advised by Matangi, Tilopa started to work at a brothel in Bengal for a prostitute called Dharima as her solicitor and bouncer. During the day, he was grinding sesame seeds for his living. During a meditation, he received a vision of Vajradhara and, according to legend, the entirety of mahamudra was directly transmitted to Tilopa. After having received the transmission, Tilopa embarked on a wandering existence and started to teach. He appointed Naropa, his most important student, as his successor. 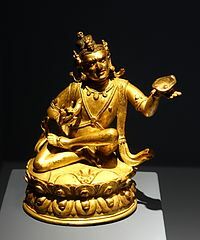 Mahasiddha Tilopa, southern Tibet, 16th-17th century AD, bronze - Linden-Museum - Stuttgart, Germany. According to Ken McLeod, the text contains exactly six words; the two English translations given in the following table are both attributed to him. Watts had studied Chinese, and Wayman was a Tibetologist and professor of Sanskrit associated with UCLA and later Columbia University. ^ Tsele Natsok Rangdröl (tr. Erik Pema Kunsang), Lamp of Mahamudra: The Immaculate Lamp that Perfectly and Fully Illuminates The Meaning of Mahamudra, The Essence of All Phenomena, Boston & Shaftesbury: Shambhala, 1989, p. 72 and n. 18. ^ "The Life of Tilopa and the Ganges Mahamudra"
Rinpoche, Chökyi Nyima; Nyima, Rinpoche Chokyi (1994). Union of Mahamudra and Dzogchen. Rangjung Yeshe Publications. ISBN 978-962-7341-21-5. Blo-Gros, Mar-Pa Chos-Kyi; (Na-ga.), Saṅs-rgyas-bstan-dar (1995). The Life of the Mahāsiddha Tilopa. Library of Tibetan Works and Archives. ISBN 978-81-85102-91-7. Rinpoche, Sangyes Nyenpa (2014). Tilopa's Mahamudra Upadesha: The Gangama Instructions with Commentary. Shambhala Publications. ISBN 978-0-8348-2974-9. An English translation of "The Ganges Mahamudra"
Several English translations of "The Ganges Mahamudra"
This page was last edited on 12 February 2019, at 22:06 (UTC).